More and more customers decide to use the world proven M8 system for industrial applications mainly because of the small dimensions. After the launch of the straight 8 pole versions in spring 2012, Binder now completes the range by adding the male and female angled 3,4,6 and 8 pole versions to this series. The grommets of the normed and molded M8 cable connectors with many contacts close together in the limited space of the contact carrier have been face-lifted. Now they have got a die-cast zinc ring with hexagon contour for easy and reliable mounting. The corresponding M8 torque key to apply a pre-defined torque is also available. These parts and all their variants are mainly used in sensor as well as in measurement and control applications. The standard cable lengths of the molded connectors are 2 and 5 m and are available with either PUR or PVC coating. On request other length variants in accordance to your individual demands can be delivered, too. 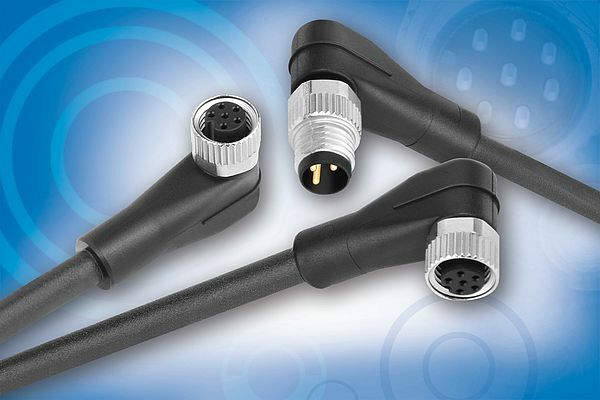 The male and female angled connectors are immediately available. When mated and locked they fulfil IP 67.